Each year since 2012, Pelikan has released a new ink of the year for the Edelstein line of inks. Last year was Smoky Quartz, the year before was Aquamarine, and this year’s ink is Edelstein Olivine. This year’s color was chosen through community submission, and the community spoke out and chose a interesting olive-green color. The Edelstein inks come in a squat, glass, 50ml bottle with a nice, wide, open mouth which makes filling pens of all sizes easy. The box that the bottle comes in has a small swatch on the outside that somewhat reflects the color of the bottle inside. The Olivine box’s color accent is an interesting green/brown/grey, but the color inside is even more interesting. 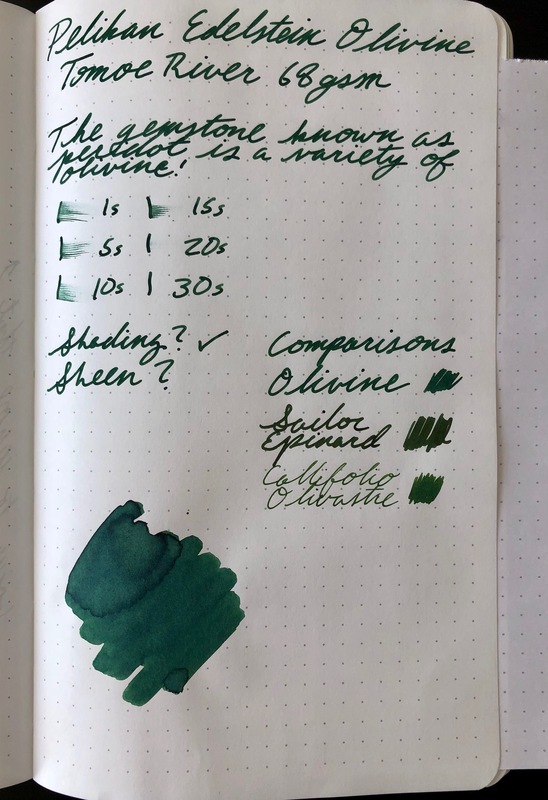 Pelikan’s Edelstein inks have a reputation for being a little on the dry side, safe for pens, and easy to clean, and Olivine is no exception. It has the same characteristics as the previous years’ inks, in a new color. 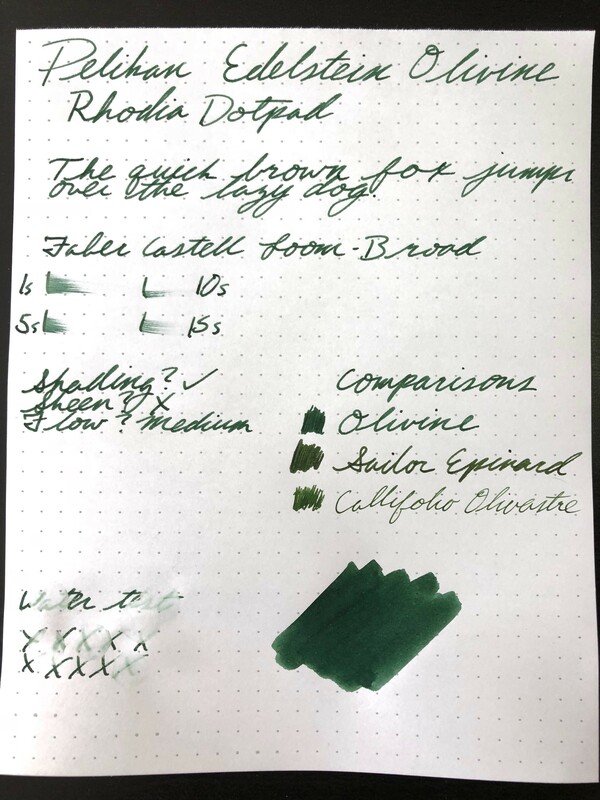 On the Rhodia Dotpad paper, Olivine comes out as a darker forest green. In the swab, you can see the range from an almost black-green to the lighter green. There was no water resistance to speak of, as expected, and no sheen even in a broad, wet nib. Dry times were a little long, but the broader nib certainly contributed to that. There are hints towards the bluer side of green, but it’s still a reserved color. On Tomoe River paper, however, Olivine’s character changes drastically. Instead of a darker, forest green, Olivine looks like a blue-green. The difference is even more dramatic when compared against some other dark greens, such as Sailor Epinard or Callifolio Olivastre. That blue-ish green comes through even in writing, which makes for a very interesting color that I wasn't expecting. 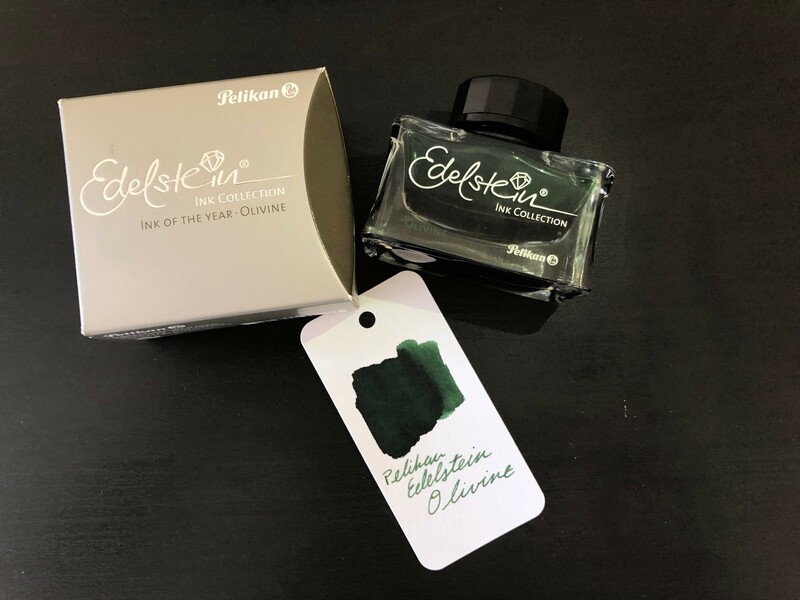 Pelikan Edelstein Olivine normally retails for $35 a bottle, but is currently on sale for $28 for a limited time at Pen Boutique, which makes this a great value. If you’re looking for a respected, respectable green with some character for your collection, Olivine is a great choice. This bottle was provided to me at no cost by Pen Boutique. I was not compensated in any other way for this review.